Fellow gardeners, get out your gift wish list and add to it: The Perennial Care Manual: A Plant-by-Plant Guide: What to Do & When to Do It by Nancy Ondra with photography by Rob Cardillo. 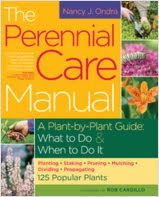 This new book on perennials has all the information you need to plant a great perennial garden and care for it. It’s like two books in one. The first part is about caring for a perennial garden and includes information on planting a perennial garden, caring for it, keeping up its appearance and troubleshooting problems. Reading through this, I think even an experienced gardener is likely to pick up some new tricks or be reminded of tips they’ve forgotten. The second part is a “plant-by-plant” perennial guide listing 125 perennials for the garden. For each perennial, Ondra includes a brief description, growing tips and seasonal care information, along with troubleshooting info, when necessary. And every flower is beautifully photographed by Cardillo. Whenever I get a new book on perennials, I always look up information on plants I know and grow to see what the author says about them. It sort of sets my “trust level” with the information. And that’s just what I did when I got a review copy of this book. First I looked up Amsonia, Blue Dogbane or Bluestar. I wanted to see if Ondra included information about its tendency to self-sow itself about the garden and if she would mention the white sap that nearly squirts out of the stems when you cut them, depending on when you cut them back. Check and check, both pieces of info were included. Then I moved on to Heliopsis, False Sunflower. I hoped she would again warn of aggressive self-sowing and also highlight the variegated variety, Loraine Sunshine. Yes and yes. Finally, I checked Tradescantia, Spiderwort. I’ve decided after years of growing it that it just isn’t all that nice of a perennial. I was happy to see that she included information that would give one pause before planting it, highlighting some of this plant’s faults. Three for three, that sets my trust level at “high” for the information on the other 122 perennials included in this book. All this wasn’t surprising to me, having enjoyed many of the posts on Nancy Ondra’s own blog Hayefield. She’s a regular participant in Garden Bloggers’ Bloom Day and most months she features several perennials that end up on my own “want” list. Ondra is truly a passionate gardener with a deep knowledge of gardening and perennials that she shares generously in this newest book of hers. I am grateful to have had the opportunity to get a copy of it to review and will keep it close at hand for quick reference. It would be a great addition to any gardener’s library, whether you are a new gardener or an experienced gardener. I also have a "litmus test" for books on perennials, although I look up different plants. With books on native plants, I always check to see if they have certain ones that I love that aren't in many of the books. I'm looking forward to reading this book, and maybe finding it under the Christmas tree this year. I've definitely put this one on my wish list. Thank you! I've made note of her book and now I'm going to go visit her blog. Some gardening books disappoint me because the information doesn't pertain to zone 4. Thanks for the book review, Carol. I trust your opinion. I think this is also a book I want to add to my forever ongoing collection as well. I too check for details that I have experienced with particular plants ! Hi, I would like to join the gardeners blog community and share what is happening in my garden here in Chile, southamerica, where I live up high in Los Andes mountains. This was an invitation from Ivonne "giardiano in Umbria" blog who told me I could do this. I´m a new blogger and I´m being fascinated for the possibilities bloggin does, to see how flowers, trees, tomates, etc. grow in different parts of the world. Thank you very much for your wonderful blog, there´s so many things I can learn from. Nice review, Carol. I'll be reviewing Nan's book soon too. Thanks for the review! I do the same thing as you, with checking plants I grow to establish a level of trust. This sounds like a quality addition to the library! I received my copy a couple of weeks ago (though it was on order for ages) and saving it to read on holiday! I love Nan's other books so I am hopeful that I will enjoy this one. Like you I start with plants I know to see how useful the book will be. Wow, Carol - thanks so much for the complete and enthusiastic review. It means so much to get a positive response from fellow gardeners like you and Dee: people who really know what they're looking for in a gardening book. I know that no one book can meet every gardener's standards, but I'm delighted that it passed your test, at least! Carol, I've been an admirer of Nan's abilities as a gardener and author for some time now and was thrilled to be offered the opportunity to read and review her newest book. I wasn't disappointed with it in the least and I know others won't be either. Thanks for the link back to my review. Happy gardening!